People ask me all the time..."Are you also a good cook?" And the answer is...sort of. Of course that question is predicated on the assumption that I am actually a good baker. And only a small portion of you out there have ever tasted anything I've baked. But work with me here. I do like to cook, though I prefer baking, but I just do it less often. With baked goods, they're easy to bring to the office, or to class, or to give individually to friends and family members. But it would be a bit strange if I brought a chicken sandwich or roast potatoes to work with me. Though I'm sure it would be appreciated. Which means that generally, if I do cook, its for one (or two). Which doesn't inspire me to try new things very often. But I do cook sometimes for friends on weekends, or if I'm home for my family. There are a few dishes that are my "specialties" and that I know will come out well so I turn to them again and again. I toyed with the idea for a while about doing a weekly Sunday post on non-baking dishes, but I would never have enough for that, so its more likely to be monthly or even less, we shall see! 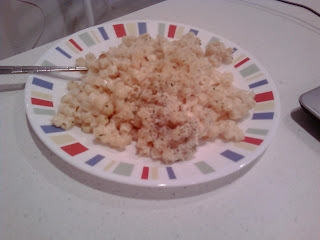 So here goes, I tried out this Mac & Cheese recipe I found on recipezaar. Recipezaar is great if you know what you want to make, but are looking for a good recipe for it, or want to see a bunch of different recipes for the same thing and pick your favorite. The ratings and reviews are also really helpful. 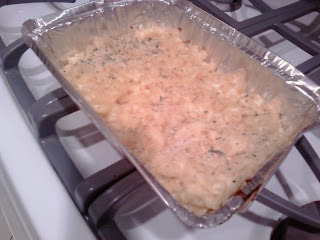 Enough about that (no they're not paying me), here it is, my baked macaroni and cheese. For starters, most pasta dishes I have will never use the right type of pasta. 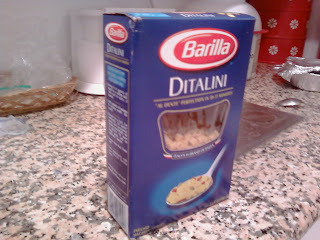 Here, I didn't use macaroni, but "Ditalini," which I found in the cupboard and looked so cute. See? Last week my friend Ariel and I made fettucini alfredo together, except it certainly wasn't fettucini. Rigatoni Alfredo, if I remember correctly. And it was delicious. Well anyway, this recipe called for you to make the sauce and boil the noodles in separate pots on the stove, which I dutifully followed. Though the recipe called for you to pour the sauce over the noodles and bake it, I thought the sauce was a little too thick for that, so I dumped the noodles into the pot and stirred it all up first, before transferring it to the pan and topping with breadcrumbs. 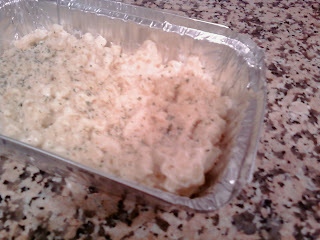 Then just pop it on the oven on 350 F for 30 minutes, and voila, baked ditalini and cheese! This picture (like most of mine) doesn't adequately show the beautiful baked cheesy goodness. It was there, trust me. Now its time to put it on a pretty plate, after all, its not very civilized to eat right out of the foil container. No, I would never do that. Ahem. Now all that's left to do is to dig in! 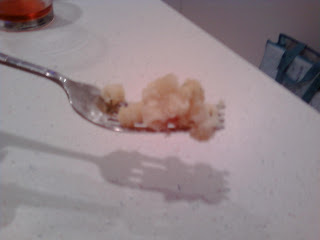 Yes, this fork is going straight to my mouth. Delicious! Hope you enjoyed this momentary sojourn into the world of savory cooking. Don't worry the sugar and spice will be back soon! Tip of the Day: Experiment with different types of cheeses in your recipes, or use a combination: if it calls for cheddar try adding in some monterey jack and muenster, but be careful - some soft and hard cheeses cannot be substituted for each other.